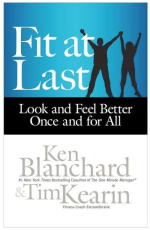 Fit at Last traces business author Ken Blanchard's weight-loss journey with fitness expert Tim Kearin, and how finally at the age of 73, Ken dropped over thirty pounds in the course of a single year. In each chapter Ken shares the personal ups and downs of his story, relating how anyone can use his Situational Leadership approach to determine their developmental level in each of the fitness areas outlined by Tim. From there, it can be decided what type of leadership someone needs to move to the next level.